An objective study of Indian Sufi literature, surprisingly enough, reveals that many early Islamic figures of India who were spiritually-inclined and inspired by Sufism, are mistakenly taken today as the ideologues of Wahhabism in India. Regrettably, our collective negligence and intellectual stagnation have concealed the pioneering contributions of great Indian mystics in the pursuit of spiritual enlightenment, human welfare and common goodwill. Those loudly claiming to represent the Sawad-Azam (mainstream Muslims) should take cognizance of the worrying fact that a large part of the Indian Sufis’ literature has not yet been published and is in the shape of manuscripts for ages. And that is precisely why they are misrepresented and sometimes defamed by the present-day ignoramuses. One such instance is Imam of Ahle Sunnah (Sunni Muslims), Shaikh Abdul Haque Muhaddith Dehlvi (958-1052A.H), one of the leading Islamic scholars of the 11th century. An epoch-making personage well-versed in the sciences of Islam and practices of Sufism, Shaikh Dehlvi rendered historical contributions to the revival and renewal of faith as well as spiritual guidance of the Indian Muslims. It would be no exaggeration to state that from the early 11th century till the late 13th century, almost all remarkable works and researches on the classical Islamic sciences in India were a result of rigorous intellectual efforts and endeavours made by Shaikh Abdul Haque Muhaddith Dehlvi. Shaikh Muhaddith Dehlvi, whom many eminent historians consider “the pioneer of the Islamic literature in Indian subcontinent”, greatly excelled in the sciences of the Rivayat and Dirayat (narration and critical appreciation) and al-Jarh wat-Ta'deel (criticism and praise) of the Hadiths. He was the son of Shaikh Saifuddin Turk Bukhari and spiritual devotee (Mureed) of Hazrat Syed Musa Gilani Quadri. Because of his deep association with Sufism and mastery over Islamic sciences, he was a source of inspiration for the Muslims of the undivided Indian subcontinent, and is venerated today by the Sufi-lovers, particularly in Delhi. Shaikh Dehlvi undertook the Hajj, pilgrimage to Makkah in 996H and remained there for a couple of years to learn from the then spiritually-inclined Ulema of Haramain Shareefain (Makkah and Madina). He spent most of his time in the Hijaz with Shaikh Muttaqi who spiritually mentored him. Thus, he excelled in the Islamic sciences and the practices of Sufism under the patronage of the early Sufis of the Hijaz. Shaikh Muhaddith Dehlvi was not merely a Sufi practitioner but also an authoritative Islamic scholar, prolific writer, commentator of the Qur’an and a profound critic of the Hadith narrations. Imbued with the spiritual teachings of the Islamic mystics like, he wrote 116 books on faith, Islamic sciences and spirituality. Among his widely circulated and greatly acclaimed works on Islamic sciences and particularly mysticism are: “Ash'at al-Lam'at (a scholarly critical commentary on the Hadiths of the Mishkat), “Tareekh al-Madina” (classical work on Islamic history), “Madarij an-Nabuwat” (a seminal work on the Prophethood and its attributes), “Akhbar ul Akhyar” (an incredibly comprehensive contribution to documenting the history of South Asian mysticism), “Zad ul Muttaqeen fi Suluk Tariq al Yaqeen” (the spiritual teachings of Shaikh Ali Muttaqi and his disciple Shaikh Abdul Wahhab bin Waliullah Muttaqi, both are Indian mystics who migrated to Makkah) and “Takmeel ul Iman” (a book candidly explaining the crucial Islamic doctrines in particular and the concepts of Ilm ul Kalam or science of theological discourse in general). In his writings, Shaikh Dehlvi often dwelled on the comparison between “knowledge of philosophy” and “understanding of faith” while explaining the rational concepts of Ilm ul Kalam at the same time. This helped many to take deep scholarly insights into the Sufi doctrines. He also gave paramount importance to reconciliation between the Qur’anic injunctions and mystical precepts. Shahaikh Dehlvi also translated into Persian numerous gems of Islamic and mystical literature. For instance, he rendered into Persian the historical document of mystical discourses “Futuh al Ghaib” (knowledge of the unseen) delivered by Shaikh Muhiyuddin Abdul Qadir Jilani, who established the Quadria Sufi order. Shaikh Abdul Haque Muhaddith Dehlvi met his lord on the 21st of Rabi-ul-Awal, 1052 AH (1642 C.E) at the age of 94. It was the era of Shahjahan’s rule in India. His shrine is situated in the famous area of Mehrauli in Delhi. 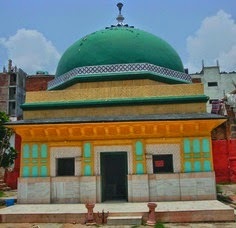 The main mausoleum is in the centre and is surrounded by the tombs of many Sufi mystics buried there. Ghulam Rasool Dehlvi is a classical Islamic scholar. He has graduated from a leading Islamic seminary of India, Jamia Amjadia Rizvia (Mau, U.P. ), acquired Diploma in Qur'anic Arabic from Al-Jamiat ul Islamia, Faizabad, U.P., and Certificate in Uloom ul Hadith from Al-Azhar Institute of Islamic Studies, Badaun, U.P. He has also graduated in Arabic (Hons) and is pursuing his M. A. in Comparative Religion from Jamia Millia Islamia, New Delhi.